Nicholas J. Fehderau: choir director and writer; born 25 June 1904 in Melitopol, south Russia, to Jakob and Maria (Bahnmann) Fehderau. He was the youngest of six children, all of whom survived childhood. While Nicholas was still young, he and his family moved to Neu-Halbstadt in the Molotschna Mennonite Settlement, where they remained until their immigration to Canada. In June 1929, he married Louise Martens in Kitchener, Ontario. The couple had three daughters and one son: Lillian, Harold, Elenore and Rita. With his health gradually deteriorating, Nicholas died at Tabor Manor in St. Catharines, Ontario, on 16 November 1989. Nicholas grew up in Neu-Halbstadt with his family, where he began his education. He studied at the village school before completing four years of secondary education (Zentralschule), two years of business school (Kommerzschule), and a year of teacher training in Heimatdorf. His father’s death in 1922 caused a mental and spiritual struggle for Nicholas. 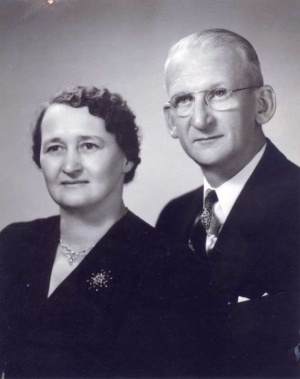 However, in 1923, he attended a series of evangelistic services led by David and Barbara Hofer, an experience he credited for leading him to a conversion experience in February of that year. He was baptized on 8 June 1924 and joined the Mennonite Brethren church in his home town. Two weeks later, on 23 June, he and his family left their home to immigrate to Canada, sailing on the Minnedosa to Quebec. From there they took the train to Waterloo, Ontario, where Nicholas obtained work on a farm before he and his family moved to Kitchener, Ontario in May 1925. Nicholas was among the early members of the Kitchener Mennonite Brethren Church, where he served on the church council for almost 40 years as well as directing the church choir from 1931-1958. As choir leader, he copied many songs, eventually changing them from the Ziffern (numerical) system to notes when these became widely used, as well as publishing a collection of songs under the title Ausgewählte Chorlieder. The choir sang in Sunday morning services at the Kitchener church and elsewhere, at special musical evenings, and eventually on a weekly radio broadcast which featured F. C. Peters and J. J. Toews as speakers. Over the years, Nicholas and the choir made the transition from German to English as the language of the churches changed. After his marriage to Louise Martens, Nicholas remained in Kitchener, working at first in various rubber factories and for 27 years at the J. M. Schneider Meat Packing plant. He continued his work in the church as his family grew. Nicholas wrote several memoirs of his life, including Skizzen aus meinem Leben vor während – und nach der Revolution in den Jahren 1904 – 1924, as well as Aus der Höhe in die Tiefen, which his daughter later had translated into English. He also wrote for the German periodical, Die Mennonitische Rundschau, contributing reminiscences of his life in Russia and Canada, including the years he spent leading the church choir in Kitchener. Nicholas retired at the beginning of 1970. His wife, Louise, died in 1987, and with his health gradually failing, Nicholas moved to Tabor Manor in St. Catharines, Ontario where he died on 16 November 1989. The funeral was held on 20 November in the Kitchener Mennonite Brethren Church, with songs from the choir Nicholas had led for many years, followed by the burial in the local cemetery. Nicholas J. Fehderau was a dedicated musician whose contribution to the music in his church had an impact far beyond his own congregation. Through his creative and disciplined work with the choir and his musical compilations he influenced the music of the church for both singers and listeners in his community. He left a legacy of faithfulness for future generations to follow. Canadian Conference of Mennonite Brethren Churches. “Nicholai J. Fehderau (1904-1989).” http://www.mbconf.ca/home/products_and_services/resources/published_genealogies/personal_papers/fehderau_nicolai_j/ (accessed 13 January 2010). Fehderau, Nicholas J. From the Heights to the Depths: Memories from the Years of Childhood and Youth in South-Russia During the Years 1904 to 1924. Translated by Margaret Harder. [Kitchener, ON: s.n. ], 1997. Fehderau, Nicholas J. "Nicholas Fehderau in Canada: My First Impressions in my Adopted Land." Translated by Herbert Enns. Ontario Mennonite History (October 1999): 14-19. Mennonite Brethren Herald (9 March 1990): 29. Mennonitische Rundschau (3 January 1990): 24. Toews, John B. “Revival and Mission in Early Communist Russia (1917-1927).” Direction 2002. http://www.directionjournal.org/article/?1266 (accessed 13 January 2010). Huebert, Helmut T. and Susan Huebert. "Fehderau, Nicholas J. (1904-1989)." Global Anabaptist Mennonite Encyclopedia Online. January 2010. Web. 25 Apr 2019. http://gameo.org/index.php?title=Fehderau,_Nicholas_J._(1904-1989)&oldid=143072. Huebert, Helmut T. and Susan Huebert. (January 2010). Fehderau, Nicholas J. (1904-1989). Global Anabaptist Mennonite Encyclopedia Online. Retrieved 25 April 2019, from http://gameo.org/index.php?title=Fehderau,_Nicholas_J._(1904-1989)&oldid=143072.